Dalhousie may still build a new rink on its own land, despite requesting the province’s help for a shared two-pad arena with Saint Mary’s University on neighbouring property. The saga to replace the on-campus rink Dal demolished last summer has many unanswered questions. One replacement option, to build a two-surface facility at Gorsebrook with assistance from Saint Mary’s, is awaiting provincial land and cash to move forward. If that proposal doesn’t work out, Dal will build a standalone rink on its premises. Jeff Lamb, Dal’s assistant vice president of facilities management, says the university has to keep in-house alternatives available. The two-pad partnership, which would include the Halifax Regional Municipality, is expected to cost between $20-30 million. Before construction can begin, the neighbouring universities need the province’s land on a parking lot south of the IWK Centre. But with goodwill established by the province in creating an excellence and innovation program, which set aside $25 million for post-secondary projects, the universities don’t want to pay for the property. “We’re hoping that in the spirit of that innovation fund, they’d contribute the land,” says Lamb. He added the universities’ proposal to the province was submitted late last year. The two-pad centre, which would conflict with the city’s earlier endorsement of a four-pad, has the support of councillor Waye Mason. Closing three small arenas in the Peninsula and consolidating them into a larger complex at the Halifax Forum site was suggested in HRM’s long-term arena strategy report last summer. “It can help SMU and Dal save a considerable amount of money. That’s an admirable goal in and of itself,” he says. Mason says the city has been asked to contribute about $7 million to the project. But despite major players backing a partnership, Dal is considering on-campus options. Under pressure to build a new arena sooner rather than later, the university may decide they can’t wait any longer for their partners to cut through the red tape. Dal’s board of governors recommended last summer that the university pursue internal and external locations. Local firm Fowler Bauld & Mitchell was hired to refine the on-campus suggestions and to submit an options analysis report to the board in June. A schematic design will be drawn this fall, with tenders completed by early 2014. It will be up to the board to decide this summer whether Dal should go forward on building an arena on their estate or to team up with Saint Mary’s, HRM and perhaps the province. This decision may be postponed depending on what progress has been made with the Gorsebrook project. Lamb suggested if the current arrangement of renting ice at the Forum is deemed sufficient for the time being, the university may elect to pursue the Gorsebrook location, despite knowing it would take longer for that rink to be built. Dal decided to tear down Memorial Arena in late 2011 rather than paying over $10 million to replace the roof and make other improvements. 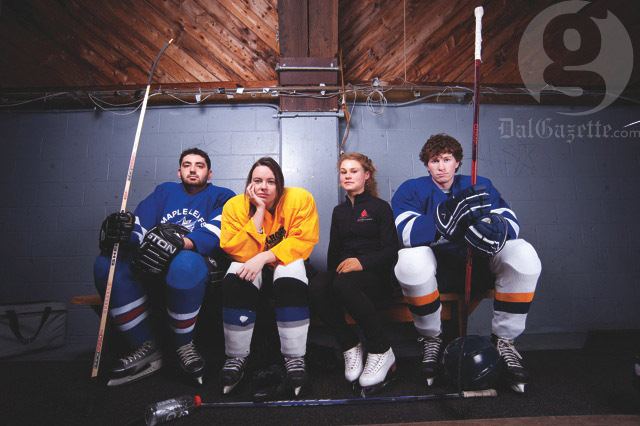 The school’s men’s hockey team made the Halifax Forum their home this season, while the women were playing in various HRM locations until a hazing incident suspended their season. At Saint Mary’s, the men’s team has been playing out of the Forum since 2003, while the women lace up on-campus. If Dal’s shovel hits the ground on-campus, the university has a few prospects. Either a standalone rink or a combined arena/fitness facility could be built where Memorial Arena once stood. The location where the Eliza Ritchie residence stands may be used to construct a new fitness facility if Dal decides to build the rink elsewhere. The single arena at the former DMA site provides the shortest time span for a rink to be completed, says Lamb. He says that arena could be ready by the 2015/2016 hockey season at the earliest. An expanded facility including a fitness centre would be completed a year later, and Lamb wouldn’t guess on a timeline for the Gorsebrook proposal. Building on-campus would have its distractors. Some neighbours have been vocal in rejecting any developments south of South Street, citing a past commitment when the Dalplex was built in the 1970s that the university would not construct any more buildings in that space. The neighbours are reportedly more approving of the Gorsebrook location, says Lamb. He says the community’s support of the two-pad is an important consideration for the university. “I think all of us would feel much better if we worked toward a solution we all agree with than fighting over one where there are options that aren’t necessarily mutually agreeable,” he says. Meanwhile, Dal’s new fitness facility is also in the early planning stages. The university held consultation sessions this week to imagine what the new gym would look like, along with planned renovations to the existing Dalplex. Dal’s Board of Governors agreed in 2010 to add a $180 charge to students’ bills to help pay for the new complex once it opens. The University of King’s College agreed to the same fee last year. A two-pad rink on Goresbrook field would be ideal. Hopefully everyone can work together to make this happen! I think an indoor fieldhouse with a regulation size/shape track is a must for the new athletic facility. Halifax is one of the only major cities in Canada that doesn’t have a proper indoor track and field facility and the amount of support this would get from local teams would help toward paying for operating costs.